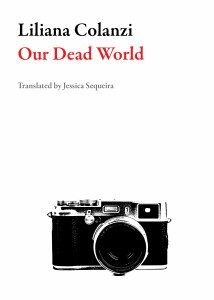 The eight short-yet-powerful stories that make up this collection reveal an intriguing new voice in translated fiction, in general, and speculative fiction, in particular. Each piece is unnerving in its own unique way, whether it deals with a lonely colony on Mars, a a psychopathic cannibal in Paris, or a girl pushed into a nervous breakdown by her fanatical mother. And while some of these stories skirt the boundaries of “speculative fiction,” they all hold up a warped mirror to reality, inviting us to question how we perceive that very reality every day. One main theme running through Our Dead World is the collision between the natural/ordinary and the unnatural/bizarre/unexplained. A colonist on Mars sees deer running past, a group of children experience the shock of a friend’s death, a young boy may or may not have been taken by aliens with the coming of a meteorite, a girl senses a strange “wave” that drives people to commit suicide. Colanzi’s narrative voice is perfectly poised and unapologetically mischievous, refusing to let the reader guess what twists and turns may lie ahead. The narrative lens zooms us in toward this arguing couple along the same trajectory as the meteorite, as if we readers are the meteorite, falling to Earth an an incredible speed toward a specific point. Once it “collides” with the Earth, though, the narrative speed slows down drastically, as we jump into the mind of one man (Ruddy) whose insomnia and hyperactivity, caused by diet pills, are making him irritable and paranoid. Soon we learn about the young boy who had only recently begun working at Ruddy’s farm and was seriously injured. The boy’s earlier comments about fire coming out of the sky and his own “gifts” take on a whole new meaning once the meteorite hits and the boy disappears. In “Our Dead World,” a woman fleeing from painful memories on Earth begins seeing visions while helping set up a colony on Mars. After one colonist commits suicide, she starts to understand just how alone she and her colleagues really are. Woven in with her thoughts about the mission are the woman’s memories of her pregnancy and painful breakup back home. Hope and despair intertwine in this piece and leave the reader with more questions than answers. Our Dead World is a fascinating read and worth checking out.